Bakers work in one of the largest, most dynamic and fastest growing sectors of the food and drink industry. Every day bakers make and sell millions of loaves of bread and baked goods, such as cakes, pies, pastries and biscuits to customers in the UK and around the world. Bakers are passionate about their industry and the products they make and take great pride in their work. There are many varied employment and career opportunities in the bakery industry. Bakers may be employed in a traditional craft bakery or in a large automated processing plant; a specialist retail shop or supermarket. Many bakers opt to set up and manage their own businesses. 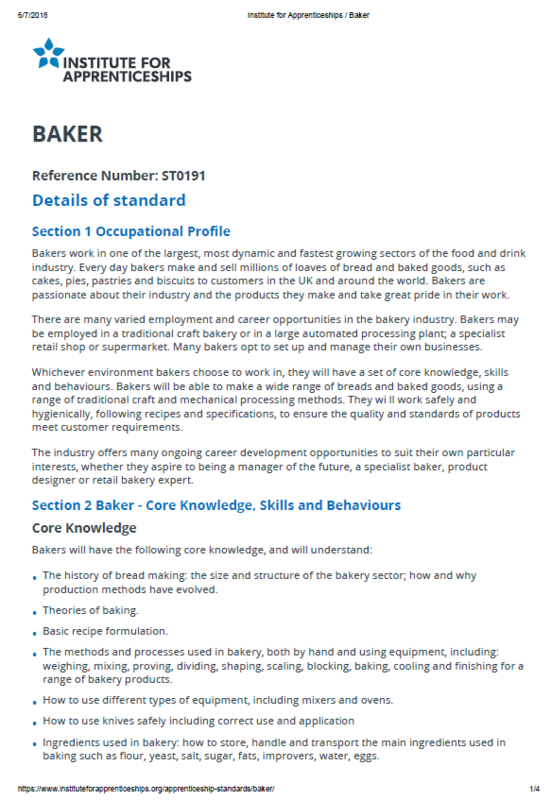 Whichever environment bakers choose to work in, by the end of their programme, they will have developed a set of core skills, knowledge and behaviours to prepare them for an exciting and rewarding career in the baking industry. On completion of the programme, bakers will be able to make a wide range of breads and baked goods, using a range of traditional craft and mechanical processing methods. They will work safely and hygienically, following recipes and specifications, to ensure the quality and standards of products meet customer requirements. After completion of the programme, individuals will be ready to enter an industry offering them many ongoing career development opportunities to suit their own particular interests, whether they aspire to being a manager of the future, a specialist baker, product designer or retail bakery expert.